Kyoto"- Little Kyoto" SUBPAGE | All Japan Kyoto Association"
Kyoto has prospered as the imperial capital since the time of Heian-kyo (Heian period: 794-1185). 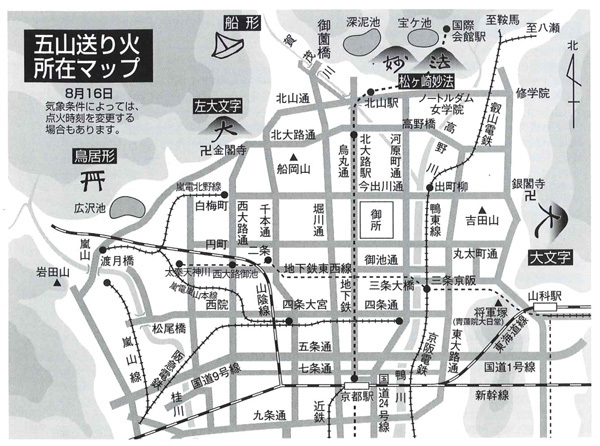 It has always been a city which people respected and wished to visit and its influence was so enormous that people around Japan tried to create their towns and cities following the Kyoto ways. 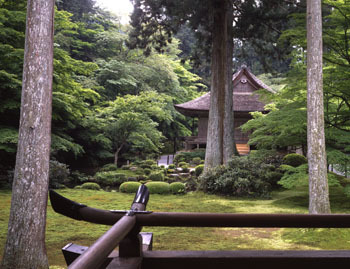 As a result, numerous “Little Kyoto” were born throughout the country. Though a contemporary big city, Kyoto remains a treasure house of all kinds of Japanese culture and art such as temples, shrines, tea ceremony, flower arrangement, noh and kyogen theatre and much more. 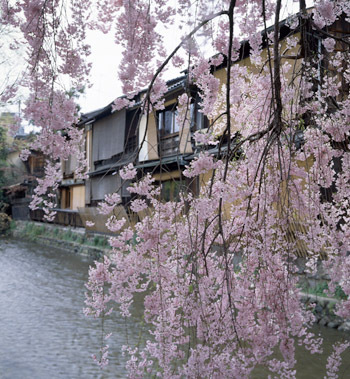 Traditions and contemporary life coexist together harmoniously in Kyoto giving rise to a city where new culture is born. When thinking about Kyoto, many people who have been to the city remember the beautiful mountain scenery on the east side of the city and the serene flowing Kamo River. The area called Higashiyama hosts a number of representative temples and shrines: Shoren-in Temple, Chion-in Temple, Yasaka Shrine, Kodai-ji Temple, Kennin-ji Temple, Rokuharamitsu-ji Temple, Kiyomizu Temple, Sennyu-ji Temple, Tofuku-ji Temple, and more. Every temple and shrine has a long history and valuable cultural assets as well as gardens which portray their scenic beauty in every season. Ohara is a name of small idyllic village in Sakyo Ward of Kyoto City. It is located at the northeastern end of the city near the west foot of Mt. Hiei and the upper stream of the Takano River. It used to be called by a different name and with a different kanji character. The village prospered as a hub on the old Wakasa Kaido Highway which connected Kyoto and Wakasa Bay in Fukui Prefecture on the north coast. Since it is geographically close to Enryaku-ji Temple, there are many temples belonging to the Tendai Sect, such as Shorin-in Temple, Raigo-in Temple, Sanzen-in Temple and Jakko-in Temple. Shiba-zuke pickles using red shiso herb is a popular local specialty. Arashiyama has long been one of the best scenic beauty sites in Kyoto for spring cherry blossoms and autumn colored leaves. Located on the west side of the city, the area was developed as a popular destination for leisure and having a villa by the aristocrats in the Heian period (794-1185). 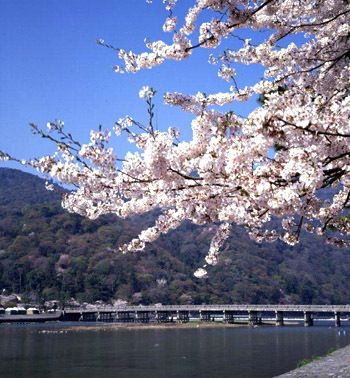 Today, it is one of the main tourist areas in the city and the symbolic Togetsu-kyo Bridge crossing over the Katsura River attracts many tourists along with the World Heritage Tenryu-ji Temple which is located nearby the bridge. The area to the north of the JR railway is called Sagano. On the path through the bamboo forest, one will come across Nonomiya Shrine, Jojakko-ji Temple and then arrive in the Toriimoto area. 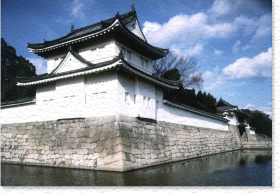 The first Tokugawa Shogun, Ieyasu, commissioned this castle to be built in 1601. The castle served as a setting of many historically important occasions such as the Osaka Winter and Summer Battle, and the declaration of Taisei Hokan (transfer of power back to the Emperor). The castle started to be opened to the public from 1940. In 1994, it was registered as a UNESCO World Heritage. Aoi Festival is one of the Three Greatest Festivals of Kyoto as well as the most elegant and historical festival in Japan. People dressed in colorful Heian-period costumes recreate the elegant atmosphere of the Heian aristocrat time. 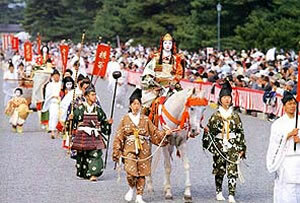 The parade of 500 people departs from Kyoto Imperial Palace and reaches Kamigamo Shrine via Shimogamo Shrine. This annual festival is dedicated to the deity of Yasaka Shrine. It is one of the Three Greatest Festivals of Japan along with the Tenjin Festival in Osaka and the Kanda Festival in Tokyo. It is also registered as a UNESCO Intangible World Heritage. With its extremely long history, this outstandingly gorgeous festival lasts for one month. 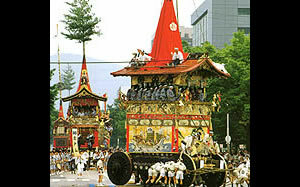 The main highlight is the float procession held on the 17th and 24th. Thirty-three massive and decorative floats are pulled through the streets by many participants. Special paid-seats for watching the procession at a good location are set along the main streets. 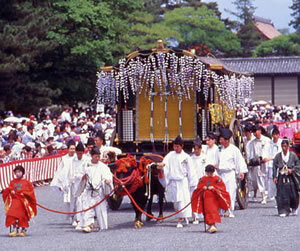 This religious event is another summer seasonal attraction of Kyoto along with the Gion Festival. 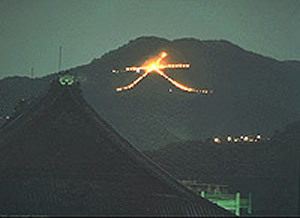 It is called Gozan Okuri-bi Fire Ceremony since a large symbol is lit by fire on the five mountains (Gozan) surrounding the city: “Dai” on Mt. Higashiyama Nyoigatake, “Left Dai” on Mt. Kinkakuji Okitayama, “Myo” and “Ho” on Mt. Matsugasaki Nishiyama (or Mt. Mandoroyama) and Mt. Higashiyama (or Mt. Daikokutenyama), “Funagata” on Mt. Nishigamo Funeyama, and “Toriigata” on Mt. Saga Mandarayama. The day of the festival, October 22, is the day when Emperor Kanmu declared the relocation of the national capital from Nagaoka-kyo to Heian-kyo (Kyoto) in 794. In addition to three rituals (Shinko-sai, Anzaisho-sai, and Kanko-sai), a massive parade consisting of 20 groups of 2,000 people in a 2-kilometer-long procession recreate gorgeous historical scenes covering from the 8th century to the late 19th century. 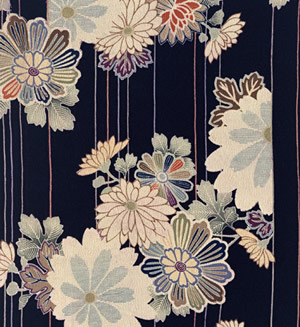 Nishijin brocade is a kind of extraordinary silk woven fabric produced in the area called Nishijin in Kyoto. 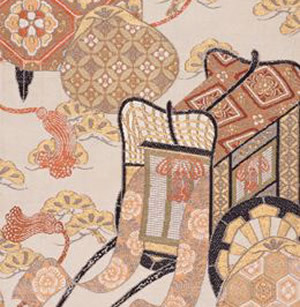 There is no strict definition about the designs and specifications of Nishijin brocade, thus, there is a wide variety. Its superb fabric is highly valued internationally along with the ones from Lyon in France and Milano in Italy. Kyo Yuzen is one of the traditional crafts of Kyoto invented by Yuzensai Miyazaki, a folding fan designer in the 17-18th century. A design is drawn on white silk cloth and dyed. In olden times, craftsmen washed the fabric after dyeing with water from the Kamo River, but most of the studios have moved out of the city today. 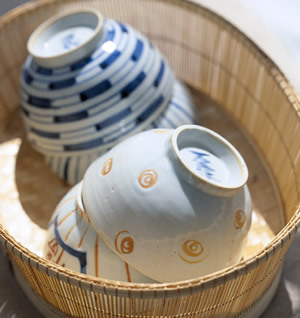 Kiyomizu-yaki is one of the ceramic styles produced in Kyoto. 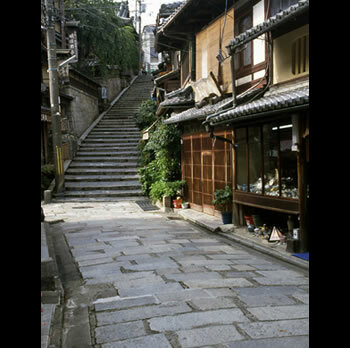 In the late 18th century, a potter named Rokube Kiyomizu opened his kiln on the Gojo-zaka slope in Kyoto. An Older style Kiyomizu-yaki often had colorful paintings which looked like the style of Ninsei Nonomura, a famous potter. From the early 19th century, porcelain style became main stream. The origin of the Japanese folding fan dates back to the Heian period (794-1185). In those days, fans were made by layering thin and long pieces of wood. Cypress was preferred as a material and fans made with cypress were called Hi-ougi. Later, the ones made of bamboo and paper were invented. They were exported to China and then reached Europe. Fans were developed in Europe and returned to Japan afterwards as the Westernized fan. 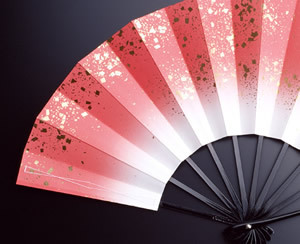 The fans made with silk are called Kinusen. In a basin surrounded by mountains with good soil and an abundant water source, Kyoto is the perfect place to grow good vegetables. 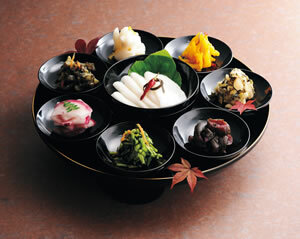 Classical Kyoto cuisine mainly uses vegetables, dried food, and soy bean products. 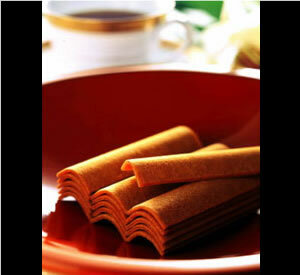 The taste is quite weak and delicate which came from the Zen philosophy cherishing the natural taste of food. 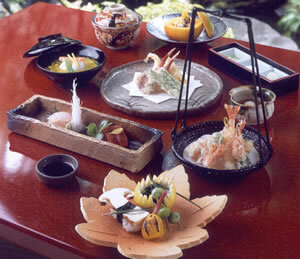 Traditionally, kaiseki is a course meal which was served by the host of the formal tea ceremony for entertaining guests with its origin lying in Zen Buddhism. 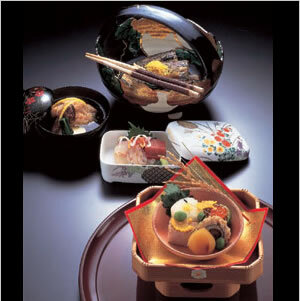 Making a kaiseki course into a compact lunch box style is called tenshin. Yatsuhashi is a very popular sweet item of Kyoto. Rice powder, sugar and nikki (cinnamon) are mixed, flattened and baked to become a hard cracker. The long curving shape looks like a Koto Japanese harp. Yatsuhashi can be enjoyed without baking as Nama Yatsuhashi (fresh yatsuhashi) which was born in the 1960s. They are eaten as they are, or some come with sweet red bean jam inside. Pickles are one of the best-preserved foods born from people’s wisdom and the blessings from nature. It has long been an essential side dish on the meal table for every Kyoto family. Small simple vegetable pickles have become a very popular and famous specialty of Kyoto today which is only thanks to the ancestors who cherished the tradition of food culture and improved it up until today.